In a scarcely noticed move last Monday, three of America's largest submarines surfaced in Asia-Pacific ports in a show of force by the US Seventh Fleet not seen since the end of the cold war. The appearance of the USS Michigan in Pusan, South Korea, the USS Ohio in Subic Bay, in the Philippines, and the USS Florida in the strategic Indian Ocean outpost of Diego Garcia not only reflects the trend of escalating submarine activity in East Asia, but carries another threat as well. The three Ohio-class submarines have all been recently converted from carrying cold-war-era nuclear ballistic missiles to other weapons - improved intelligence sensors, special operations troops and, significantly, a vast quantity of Tomahawk cruise missiles, a manoeuvrable low-flying weapon designed to strike targets on land. 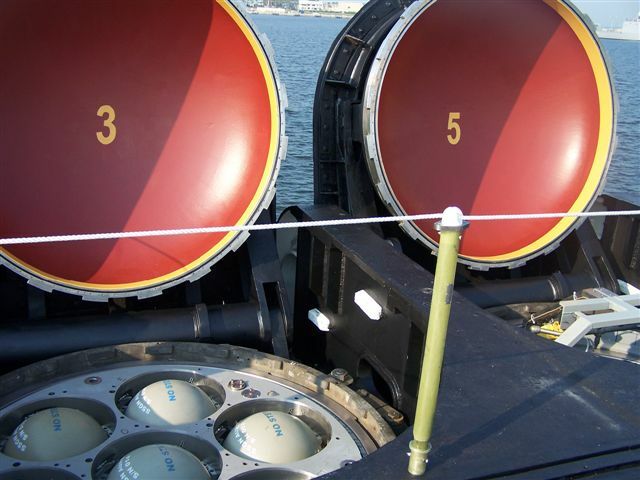 How many SSBN's do we still have in the Fleet? More to the point, how many Trident warheads? It does change the equation a bit, because once those boats submerge, they could be anywhere. China’s ASW capabilities have grown, but hell, WE can’t reliably find Ohio class subs. They’re just too quiet. Carrier battle groups are flashy, but China has worked long and hard to counter that threat. Now, however, any estimates a Chinese war planner might have regarding the correlation of forces in a particular region are going to be suspect. Chinas military buildup may be undermining the countrys relations with Japan. China is estimated to have about 400 nuclear warheads and is building new missiles including the Dong Feng 31A, an intercontinental ballistic missile with a range of 14,000 kilometers. The shorter-range Dong Feng 21C missile has Japan well within its range and Chinas new anti-ship ballistic missile travels at supersonic speeds. The Peoples Liberation Army (PLA) is also constructing underground bases for nuclear missiles in mountainous areas in Henan and Shanxi provinces, aimed at protecting them from preemptive strikes. "If we place U.S. aircraft carriers and U.S. bases in Japan within the range of our missiles, the U.S. fleets will not be able to enter the western Pacific freely. As a result, we will make the Japan-U.S. Security Treaty ineffective," said a PLA source in comments. The PLA has also developed state-of-the-art Song-class and Kilo-class submarines with quiet propulsion technologies that make them difficult to detect. According to the International Herald Tribune (Asahi), the Japanese Defense Ministry asserts Chinese destroyers have been detected near Miyakojima island and Okinotorishima island five times since 2008. Awesome, what they're saying is that China had no idea where these subs were. Just a good old cold war warning, we can see you, you can't see us. Osubs would have asked for permission. It is not a provocation. It is a reminder to China and our allies that those submarines are always there, just under water. China has been flexing their military muscle by increasing their naval presence in that area so they needed a reminder. We only surfaced and brought into strategic ports three of the many out there. "It does change the equation a bit,"
It would be a little disconcerting to ChiComs to suddenly have tactical threats just pop up out of nowhere. Especially, since the Red Chinese just made a big deal about changing their defense budget from 80% Army 10% Air Force and 10% Navy, to 50% 25% and 25% respectively. Then there is their new generation fighter. And Communist China recently boasted about finally acquiring enough missiles to defeat Taiwan. For Subic Bay these are routine scheduled visits. The Santa Fe was there last December and the Houston in March. However the December visit was the first since 1991.. When did 7th Fleet ships start returning to Subic Bay? Ohhh, Olongapo? Me love you LONG TIME! Surface ships have been coming in and out since about 2005 that I can remember. As I think about it there may have been a couple of submarines in 2008 that came down from Japan. But I'm sure they will still find as much R & R as they can stand in the PI.. Thanks for the details. In addition to the Ohio class submarines: ... the Pentagon is shifting 60 per cent of its 53 fast-attack submarines to the Pacific - a process that is now virtually complete. 60% of 53 is 31.8. I would hate to be on that .8 submarine. What about the old madam who used to convoy around Olongapo picking up the receipts from her cathouses in a couple of Ma Deuce-equipped Jeeps? I heard about her from a dues-paid member of the Tonkin Gulf Yacht Club, back in the day. Her, and San Miguel beer. After the runs go away, you're addicted for life, or something like that.